Whats this about Meteors and Stars? Has our Webmaster gone bananas? Has he confused his love of Astronomy with his love of Customlines? Actually the "Meteors" is referring to the 1955/56 Canadian "Meteor" and the "Stars" is referring to the 1958/59 Australian "Star Model" Customlines. What I am trying to do here is to lay to rest any questions as to where the origins of our Star Models came from. Further below is an extract from Norm Darwin's book "The History of Ford In Australia" which gives an outline of the history of the Fords from 1955 to 1960. 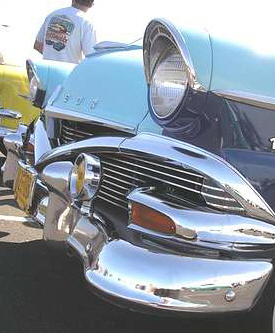 With the 1955 Meteor models there is no mistaking the curved back vertical bar grille with the two large round parker lights on each side and the large distinctive V with the Star in the middle. Compare them with our 1958 Star Models on the right and you can plainly see the roots of the Starry Grille. 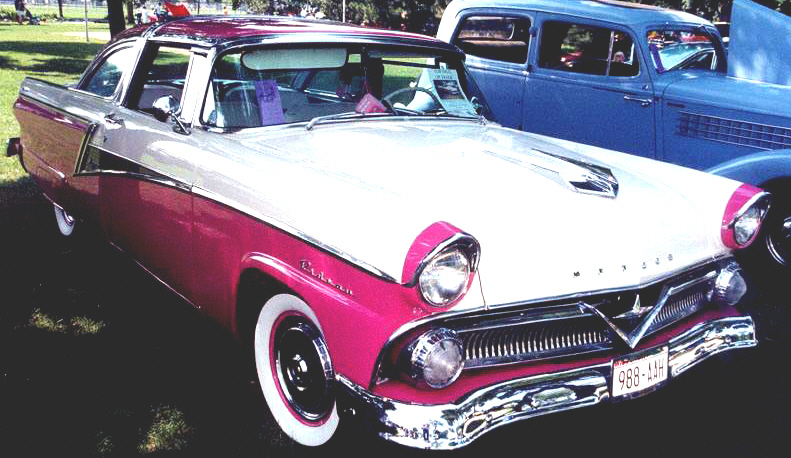 The Yanks refer to our Star Models as 1955 Meteor Customlines. You can also note that they both have the headlight surround "Eyebrows" fitted. 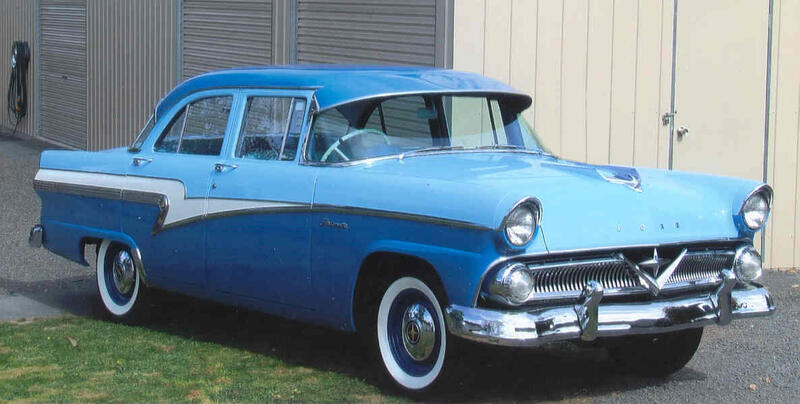 You will also see from the pictures below that the side trim mouldings of our Four Door Star Models came from the 1956 Meteor Sedans, although the first two pictures show the 1956 Metero Rideau Four Door Town Sedans. There were 38,397 1956 Meteors produced and only 5,337 Four Door Rideaus produced. The Sedans used the same design mouldings as the Two Door Rideaus below. The side trim moulding for our Four Door Star Models were easily reproduced as Ford already had the presses to make the side trim mouldings for their 1956 Four Door Meteor Sedans. You can see from the pictures below that the Bonnet Ornament on our Star Models came from the 1956 Meteors once again, although the pictures show the 1956 Meteor Rideau Victorias. Some of our early 1958 Star Models were fitted with the 1957 bonnet ornaments, and you can also see that our 1957 Bonnet Ornaments came from the 1955 Meteors (above), and like the 58's some of the early 57's were fitted with the 1956 bonnet ornament. You can also see that the 1956 Meteors, the Rideau in this pictures at left and above, has a side to side very large V shape grille with the Star making up part of the grille and the bonnett. In fact the part of the grille above the V opens up with the bonnet. You can also see that they used the oval parker light assembly that were used in our 1956 and 1957 model Customlines. and our 1958 Star Models to the right. OK, that settles that, but what about the dashboard you say. 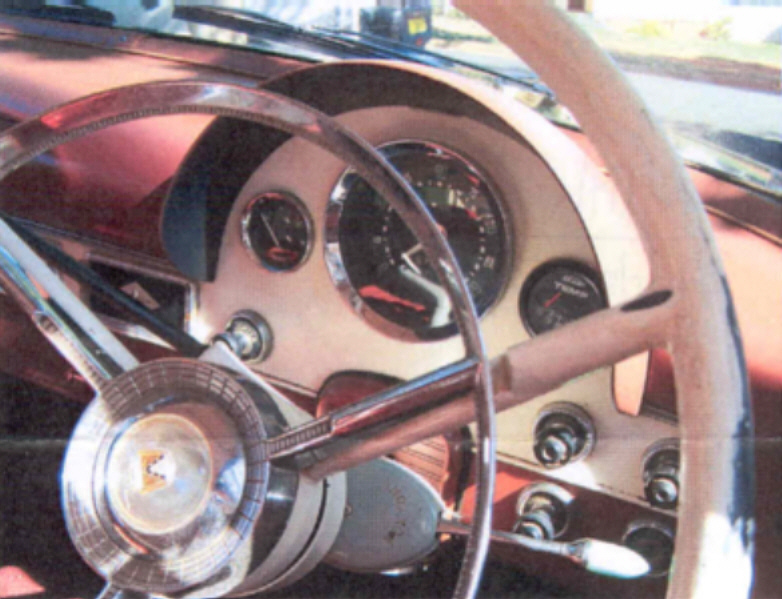 The dashboards in our Star Models were fashioned after the dashboards in the 1956 Canadian Fords, which had a large round speedometer with four smaller gauges set with one on each side and two slightly below the speedo. Our Star Models were only produced with two smaller gauges set either side of the speedo. 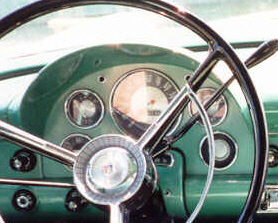 1958 Star Model Customline Dashboard Right hand drive vehicle. 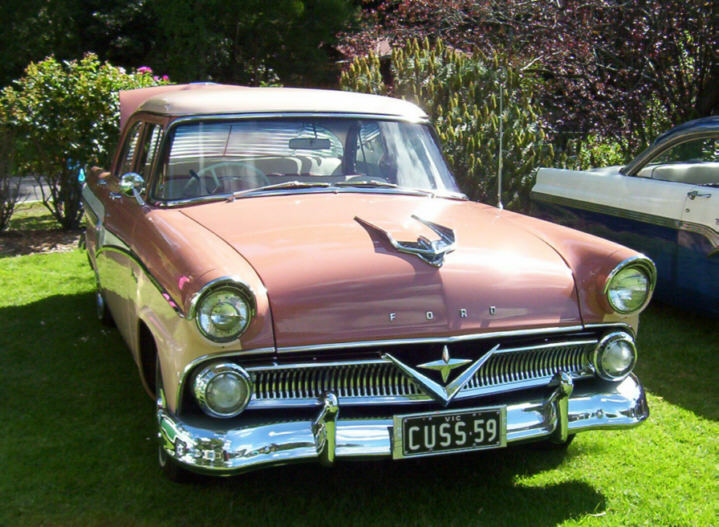 A brief outline of the 55 to 60 Fords in Australia. Alongside the Zephyr Six and the English Fours, Ford continued to sell us the US V8. The OHV Customline, released in 1955 (Aust), spelt a new type of model for the Australian public, big and powerful with the first OHV V8, but priced well within the reach of the average man. Ford Australia also began exporting CKD packs of Mainline Utilities, 300 packs left for NZ in October 1956. 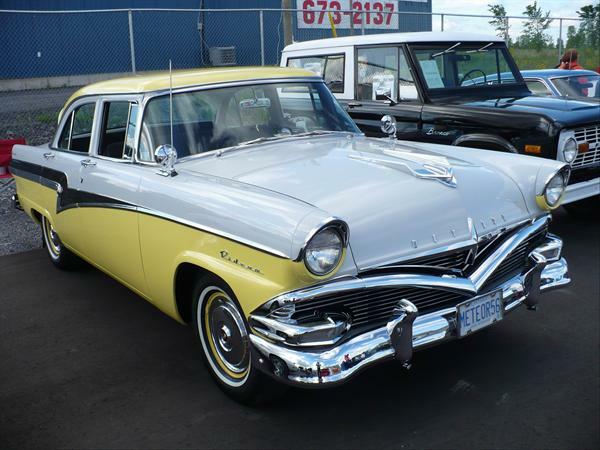 The Australian models essentially followed the Canadian Customline for 1955 and 1956, the 1955 Customline was released to the Australian public in August 1955. Its performance was excellent for the day, test drivers found that the Customline did not need to be shifted down for passing, it's top speed was around 95MPH and the standing quarter mile covered in 19.7 seconds (achieved with a full tank and two passengers). The price was £1694. The car was summed up as, "a six-passenger, high performance saloon which is economical and handles well". Economy returned was 19.9MPG cruising and 16.7 with hard driving. The 1956 Customline price jumped to £1705, it's principal competitors were the Chevrolet Six at £1683 and the Dodge Kingsway Six at £1787. 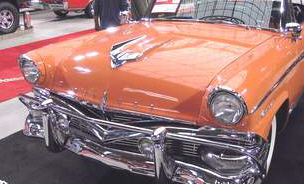 The 1955 body was retained as it was in USA and Canada, with new grille and trim. Ford Australia chose to use the 55 dashboard again in their 56 models. Big news was the introduction of 12 volt electrics and the Fordomatic option. 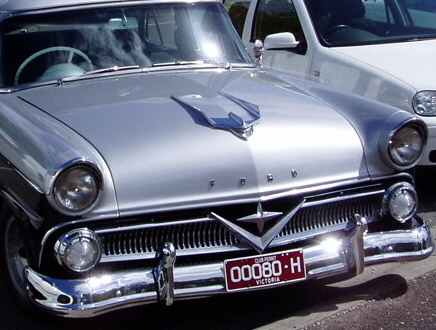 For 1957, the 1956 Australian body was retained but updated (for Australia) by using 1956 Ford Fairlane trim plus a large V8 badge in the grille and chromed headlamps. This now meant that Ford Australia were "out of alignment" with Ford US in not having equivalent models. In 1958 we saw the Australian cars again using the 1955/56 body but now had a 1955 Canadian Meteor grille with a four pointed star plus 1956 Canadian Meteor side trim. These cars also featured triple colour paint schemes and Smiths (Aust) instruments. Both the Ford and Meteor were sold in Canada with the same body. 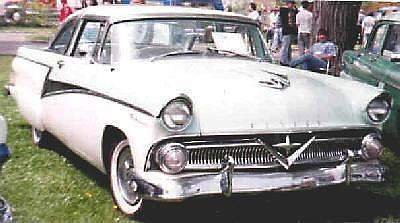 Ford Dealers handled the Ford and Mercury Dealers the Meteor. With the bulk of investment funds being poured into the proposed Falcon, costly annual model-updates on the Customline were out of the question. The 1958 series was tagged the "Star model" and was the last of the Customlines, this was also the last year for the Mainline Utility. The price of the Sedan was £1899 for the manual and £2063 for a Fordomatic. 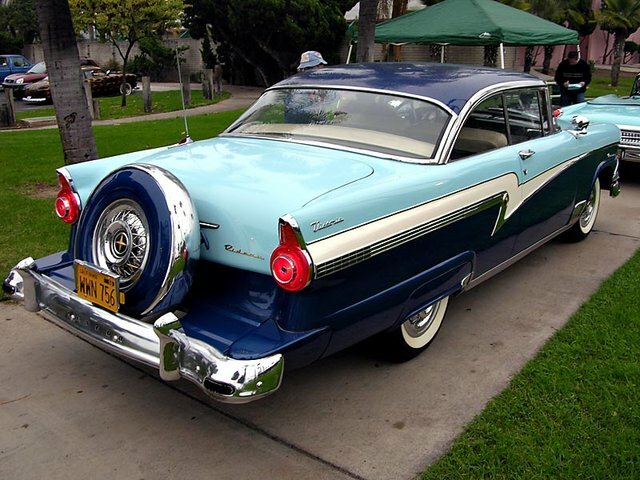 For 1959 the Customline was replaced with the Fairlane, later coined the "Tank Model". 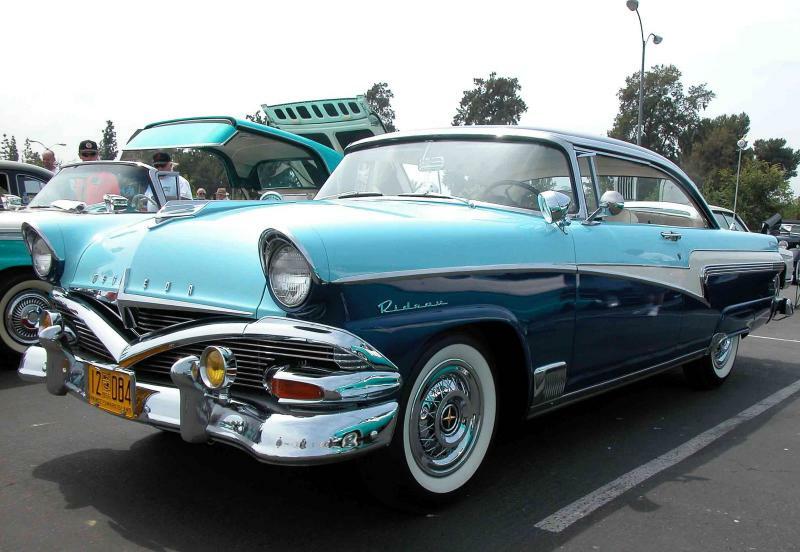 It was available in Custom 300, Fairlane 500 and Ranchwagon (derived from the Custom 300 series). The 300 cost £2173 (manual) the 500 £2463 (automatic) and the Ranchwagon £2450 (manual). 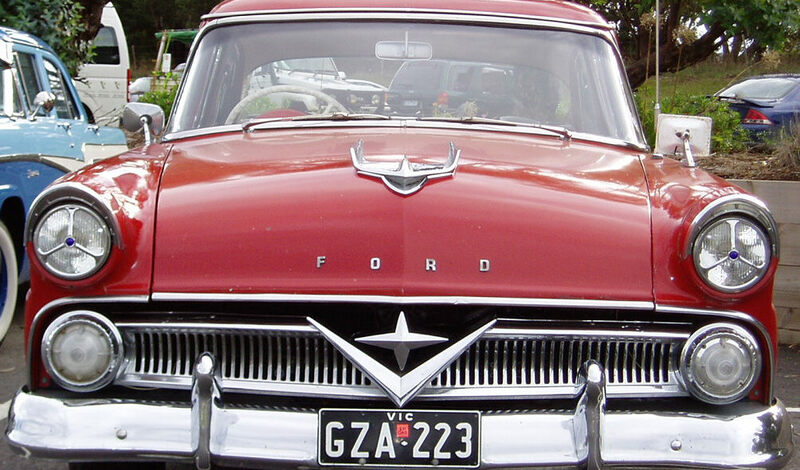 In 1960 the "Tank" was revised and now utilized the grille and trim from the 1959 Canadian Meteor, this made it the third time Ford Australia was out of step with the US. This information was gleaned from Norm Darwin's book "THE HISTORY OF FORD IN AUSTRALIA", (1999 Edition). Here are a few interesting numbers below.